Some folks refuse to stray from the beaten path, some cut their own path. I'm one of those that'll cut my own. I have no problem modifying an existing game's rules to make it more enjoyable to play. Fortunately, my friend feels the same way. I want to say it's not much, but when I printed it all out, it looked like a good bit more (It's only three pages with lots of white space). For the most part, we just modified the things that didn't make sense to us. As if we have any experience fighting aliens in deep space. That didn't stop us from making changes to the game so it played the way we felt it should. It's been a long road to get to this point. We started out using the basic rules with no modifications. After a few games playing like this, we found certain situations would keep coming up that just didn't seem right to us. Where the existing rules just didn't capture the in-game effect we wanted. We decided to start making small adjustments here and there to the rules to capture the in-game effect and feeling we wanted. Adding something here, removing something there... whatever it took. Sometimes we looked to other games for inspiration and solutions, sometimes we just went with our intuition. After every change, we'd play a number of missions to test it out. Basically trying to "break" it by putting it through as many different situations as possible. We wanted to make sure a small change here did not create an unanticipated impact over there. The butterfly effect as it's known. If need be, we'd stop a game and work through the problems until we had a workable solution and then start playing again. After enough games, the new "rule" was adopted and used from that point on. For each rule, this process varied in length. Sometimes it took a half dozen games to work through a solution, sometimes it was done before the end of a turn. A nice feature of Space Hulk is that both players get to play both sides. That tends to balance it out and you don't end up fighting for one side all the time. You end up working towards a greater balance because you never know which side you'll end up playing in a given game. Space Hulk is an incredibly well designed game from the start. There's no doubt about it. We were extremely careful not to disrupt this core design. We wanted to keep the overall feeling and pace of the game the same and not have any of the rules we added or changed to have such an impact on the game as to alter it into something new. Where we could, we opted to use existing game mechanics instead of adding something new. We tried to keep the "new" things we added to the game to an absolute minimum and only if we could not use an existing mechanic to replicate what we wanted. While this may seem small, it made a huge difference in how we approached things. As time went on, we found our modifications to the game growing in number. That's when we stopped and took a few steps back. We took a hard look at the ones we were no longer using and got rid of those. We went over the ones we used all the time and made sure they still worked the way we wanted. What follows is our current set of modifications. There are others, but these are the core modifications we use in all our games. It's a PDF you can download for free and use in your games of Space Hulk. I encourage you to try them out! If you use Librarians in your games, download the psychic rules here. All the Space Hulk downloads can be found on the DOWNLOADS page. At first glance, they may seem to make things unbalanced. I can assure you they do not. These rules have been playtested regularly for over two years now. We've gone through the entire mission book twice using these rules in addition to a number of previously published official campaigns along with our own campaign (which will be posted in the future). We have tried to break them in every way possible and they hold up. To be completely transparent, these rules do make it a bit tougher on the Marine player. This is only because we as Marine players are used to having a bit of leeway when it comes to operating in Terminator armour. It'll take a few games as the Marine player to get used to no longer having that extra "wiggle room" so to say. You'll be a better player because of it. Please email me if you use them and let me know how they work for you. 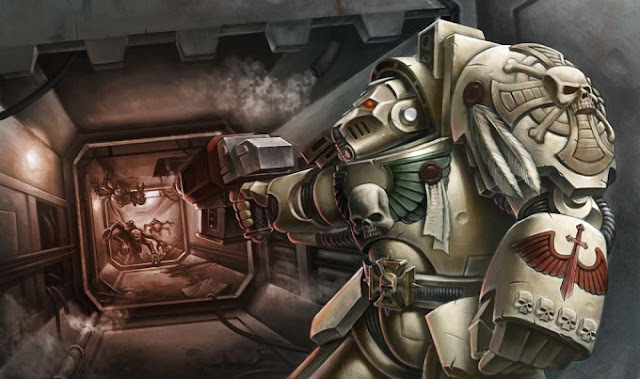 I'd love to hear what you think or what rules you're using in your games of Space Hulk. IMAGE: Deathwing Terminator Illustration by albe75. 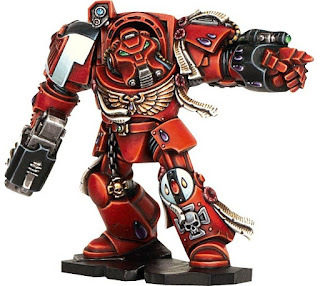 GW Blood Angel model.